So daring a concept as spanning the East River to join two great cities required vision and dedication of the kind that went into building Europe's great cathedrals. During 14 years of construction, the odds against success seemed overwhelming. Thousands of people were put to work. Bodies were crushed and broken, lives lost, notorious political empires fell, and surges of public doubt constantly threatened the project. But the story of the building of the Brooklyn Bridge is not just the saga of an engineering miracle; it is a sweeping narrative of the social climate of the time, replete with heroes and rascals who helped either to construct or to exploit the great enterprise. The Great Bridge is also the story of a remarkable family, the Roeblings, who conceived and executed the audacious engineering plan at great personal cost. Without John Roebling's vision, his son Washington's skill and courage, and Washington's wife Emily's dedication, the bridge we know and cherish would never have been built. Like the engineering marvel it describes, The Great Bridge, republished on the 40th anniversary of its initial publication, has stood the test of time. 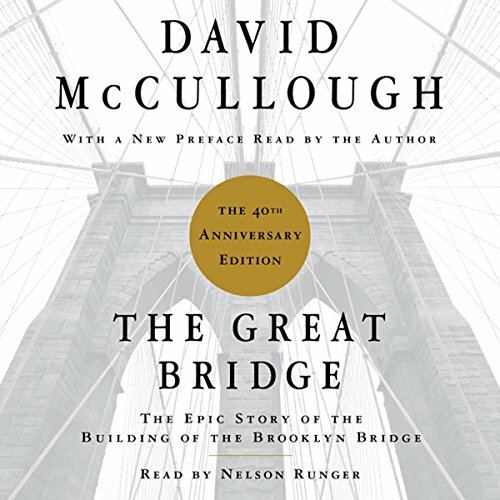 Please note: The Great Bridge (Unabridged) is available for just one credit until June 20, 2012, after which point it will be priced at two credits.